Several weeks ago, I paused to reflect on what Chicago City of Learning has become over the span of just 2 short years (it’s still hard to believe). And just two weeks ago, in the company of over 100 friends – #StateofCCOL! – we had the privilege of celebrating the collective gains that we have made in this movement to build an infrastructure for connected learning among those who touch the lives of Chicago’s youth. One thing made clear in the lovely room at the Peggy Notebaert Nature Museum, in and of itself, was how critically central a network of youth-serving organizations is to the development and sustainability of a living, breathing connected learning ecosystem. Because of the commitment and partnership of the 150+ organizations who have joined us and joined together to make their program opportunities visible on our site and articulate their program outcomes using digital badges, our learning ecosystem thrives in our great city. But this ecosystem work is not about each organization “representing” itself and its youth’s achievements. Rather, it is about the potential energy generated by the inter-connectedness across organizations. By definition, an ecosystem is a community of living organisms interacting as a system. And while the first step in building a connected learning ecosystem is to establish the community – to identify and convene the “organisms”, as it were – a connected learning ecosystem’s life-sustaining power and vibrancy is the result of the dynamic ways in which its organizations continuously organize, connect, and exchange. These connections to the work harken back to the moniker we gave ourselves two years ago, when we envisioned what it would look like to turn Chicago into a “campus of learning” for our youth. 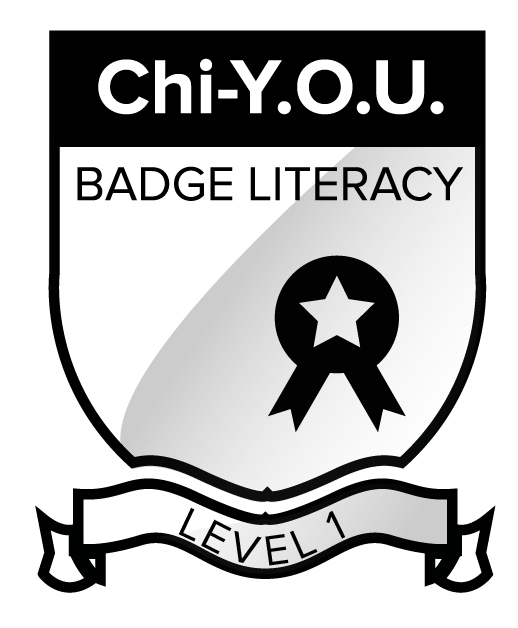 “Chi-Y.O.U.” – Chicago’s Youth Owned University – represented our hopes and dreams for what we, working together, might provide the city’s young people – a system designed for their pursuit of interests within and across all of our program offerings. Our treasured, inspired, and inspiring community of youth-serving organizations is the heartbeat of the connected learning ecosystem that we have built here in Chicago. And the data that we are beginning to examine together are enabling us to better organize, more intentionally connect, and deliberately partner in ways that facilitate youth in accessing and, ultimately, crafting pathways to opportunity. We Built This City of Learning! We all can relate. Working so hard, with nose to grindstone, failing to stop to take in the work, or smell the roses, as it were. That’s how it was for us here at Digital Youth Network, then one September Saturday afternoon we found ourselves wading and weaving through 1200 youth and families who reflected every diversity of our great city and who were excitedly engaged in making “stuff”, connecting with each other, and reveling in the talent of Chicago’s youth. That’s when we had to stop and say to ourselves – “What we have achieved here is amazing!”. That moment of awe turned into something greater – a consideration of our history and all of the amazing people and organizations that have made Chicago City of Learning what it is. 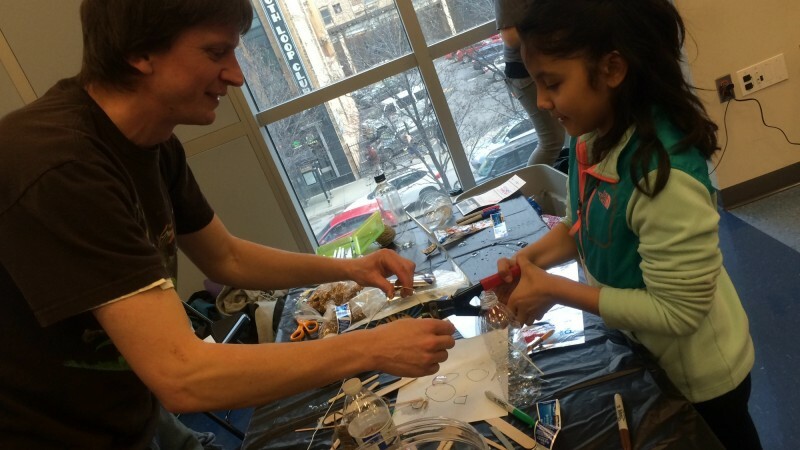 A Snapshot of the Chicago City of Learning Back to School Jam, September 19, 2015 (Chicago Art Department). 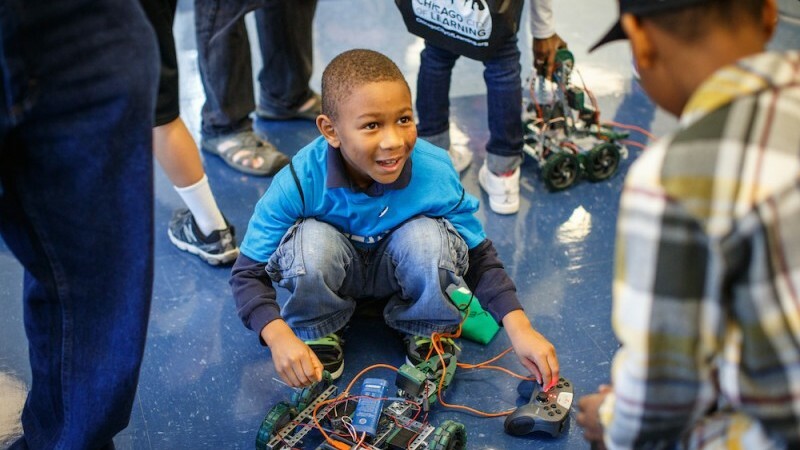 In the summer of 2013, the City of Chicago’s Mayor’s office did something that no other city had done before – connected its learning opportunities through an initiative called Chicago Summer of Learning. With funding from the John D. and Catherine T. MacArthur Foundation and largely “powered by” a Mozilla Foundation platform, Chicago Summer of Learning made the programs of hundreds of organizations easy to find online and the achievements of youth easy to identify via digital badges. That summer, thousands upon thousands of the youth who engaged in programs earned badges that indicated their participation and skill development. The Chicago Summer of Learning initiative was deemed a success. It quickly became clear that this “initiative” was actually an “infrastructure” – an infrastructure for a connected learning ecosystem. Enter Digital Youth Network (DYN). Our youth-centered, DePaul University-based organization has been an engine for learning innovation in Chicago for the past 12 years, with the support of the MacArthur Foundation, the Gates Foundation, and the National Science Foundation. DYN was borne from a question that challenged Dr. Nichole Pinkard, now a professor at DePaul’s College of Computing and Digital Media and head of its Design School. That single question, “How do we address the digital literacy divide that Chicago’s South Side youth face?” led not only to more questions, but to action and “intervention”, propelling DYN from working in the after-school space, to collaborating in formal school spaces, to innovating in library spaces, including our co-design of the now-national YouMedia model. 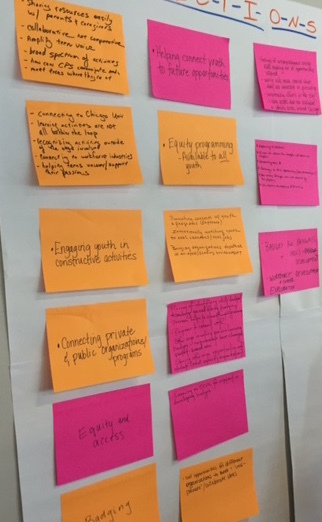 As Chicago Summer of Learning evolved into the year-round Chicago City of Learning (CCOL), DYN stepped up to lead and facilitate the work involved in building a robust city-wide infrastructure designed to address the opportunity gap that exists between more- and less-resourced youth. Such an infrastructure might be powered by a technical platform – and we built one based upon our expertise in creating our own social learning network – iRemix. But a truly robust learning ecosystem infrastructure is powered through the dynamic interplay of several critical components that together, in addition to the platform, serve to make visible and connect learning opportunities for youth across spaces and places. The first critical component of a thriving learning ecosystem is a community of youth-serving organizations. Our 100+ CCOL organization partners are the key to Chicago City of Learning’s success so far. They include numerous small neighborhood-based organizations, as well as our big city agencies and many of Chicago’s museums and cultural institutions. As a collective, they share a mission to support the positive development of youth across a broad age span, and therefore quickly “get” the need to make their opportunities more visible and accessible. In the Fall of 2013, we asked our CCOL partners to imagine Chicago as a college campus, and their programs as the available “courses.” In small groups, they made connections between each individual organization’s “course offerings”, forming unique “departments” that our youth could “major” in, like “Civic Leadership and Community Development” and “Green Studies.” Our partners were abuzz with the vision of Chicago’s youth traversing the city, exploring their passions, and building an interest-based “transcript.” That day, we, this network of youth-serving organizations, dubbed ourselves “Chi-Y.O.U.” – Chicago’s Youth Owned University. It’s not enough to have youth-serving organizations in the same room – they have to begin to speak the same language. 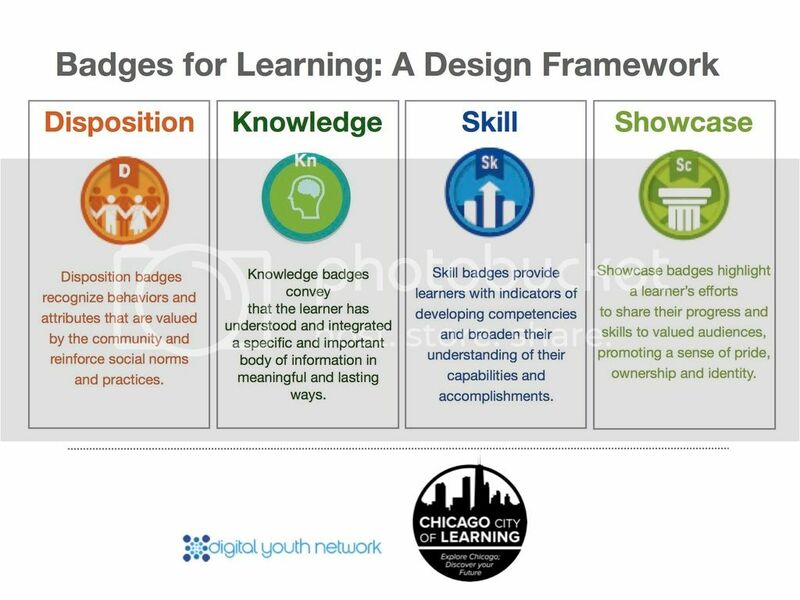 In Chicago City of Learning, we use digital badges, to “translate” youth experiences and achievements into a “language” that can be used across formal and informal spaces. The DYN badge framework provides the basic units of that shared language – enabling organizations, and schools, to identify and recognize youth achievements in the same way across different experiences. The badge framework identifies important dispositions, skills, and knowledge sets demonstrated by learners in the context of their experiences. It also recognizes when youth showcase those abilities to a broader audience. Digital badges are terrific tools – an efficient way to share a wealth of data, including evidential artifacts, about learning. However, because they were still a shiny new toy, we found that they often became the focus, and could be a distraction from the learning that they represented. So, DYN developed a 12-hour badge design process that led with learning in two important ways. First, we firmly grounded our professional development and the Chicago City of Learning work in the values and principles of connected learning. Chicago Art Department developed a series of Connected Learning videos for DYN’s CCOL training series; this one highlights the design principle of “Openly Networked”. Second, in the badge design process itself we required organizations to unpack their programs, starting first by calling out their targeted learning outcomes and thinking about the ways in which youth demonstrated those outcomes. Only after such deconstruction did we delve into the badge framework, with organizations identifying the types of badges that best fit the kinds of evidence of learning that they gather and assess as youth participate. Many organizations have told us that this process, while lengthy, not only helps them better articulate their program goals, but also gives them a chance to reflect on and question the focus and efficacy of their work. In 2014, Los Angeles, Dallas, and Pittsburgh followed Chicago’s lead and implemented their own Summers of Learning. Washington, D.C. joined in 2015. We shared our badge framework and training approach with our colleagues, resulting in a shared national framework and approach. We envision a future in which a Chicago youth shares select disposition and skill badges from her digital backpack on her Howard University application, and the admissions officer knows exactly how to “read” them, because of the strength of the learning ecosystem that District of Learning has built. We all know that “if you build it”, they won’t necessarily come! We also know that if what you build is situated in a societal context that has not changed structurally, then those who are less resourced are least likely to find “it” and reap its benefits. In order to achieve equity within a robust learning ecosystem, one must do so “by design”. At DYN, our team has developed a conceptual framework for designing learning pathways. This research-informed framework proposes that issues of identity, social capital, and equity are central and critical to the design of pathways that enable youth to pursue their interests into the future. These pathways must affirm new possible futures by supporting youth’s development of specific dispositions, knowledge, and skills; by connecting youth to socially networked peers and mentors; and by providing youth with special opportunities that translate into the social and cultural capital that they need to access pathways to college and career. Within the context of Chicago City of Learning, we have co-designed, with several writing organization, a pathway to support youth interest in writing, which has begun to be taken up by teachers in classrooms. Chicago City of Learning’s Young Author Playlist unlocks a special opportunity for 5 Chicago youth (Chicago Art Department). And this year, for the first time, we were able to connect youth to pathways to employment through our role in the 100K Opportunities Initiative, which held its launch event in Chicago. The historical data that CCOL holds enabled us to identify and refer 2100 youth to the 100K application and hiring process based on the badges that they had earned during their 2014 One Summer Chicago jobs. These badges, earned by reporting to work 100% or 80% of the time, were evidence of the reliability that employers seek from entry-level employees. This was the first time that we were able to make a connection between badge-earning and pathways to jobs! Highlights from the 100K Opportunities Youth Fair and Forum (Chicago Art Department). Learning pathways are critical components of robust learning ecosystems – those that are constructed intentionally to make visible the way forward, those that emerge as youth pursue their interests and discover their passions, as well as those that youth design for themselves. Our work to build equitable pathways for youth within the Chicago City of Learning ecosystem has revealed the challenges inherent in designing for equity. And while we are inspired and energized by the paths that the youth who have connected to CCOL are blazing into the future, there is still much to be learned. So, we have a platform that powers the infrastructure; we have a community of partner organizations whose offerings “populate” the learning ecosystem; we have digital badges that make more visible both the achievements and achievement patterns of youth; and we have frameworks and tools for identifying and designing interest-based pathways for youth to pursue toward college and career. These components are the makings of a robust, city-wide learning ecosystem, and this system generates a host of data that can, and should, create feedback loops that inform ongoing planning, action, and “intervention”. As CCOL enters its 3rd year, we are at that “tipping point”, where there are enough data available, and enough reliable data, to inform action and even intervention. Just this past summer, we used data to examine the types of programs that were being offered across the city, with a special interest in computer science, a field that in which youth of color and girls are woefully under-represented (and one in which DYN holds specific expertise and resources). 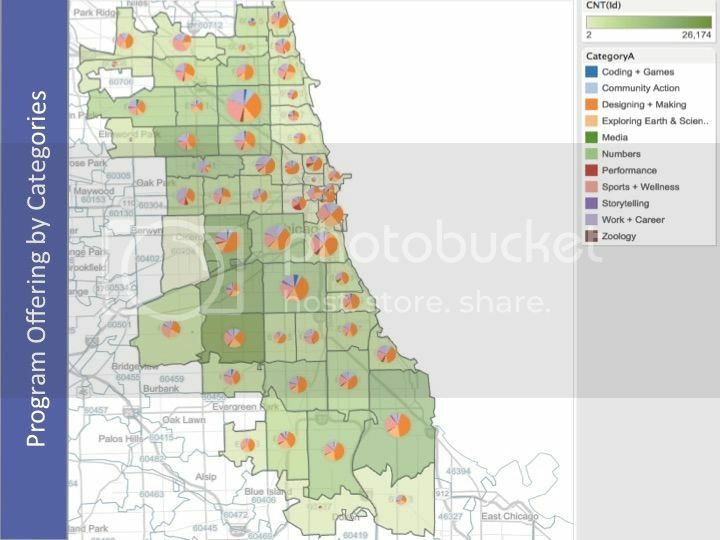 CCOL data indicated that the “coding and games” offerings (the dark blue part of the pinwheels in the graphic below) were fairly scarce, more likely to be downtown, and likely to be cost-prohibitive for lower income families. 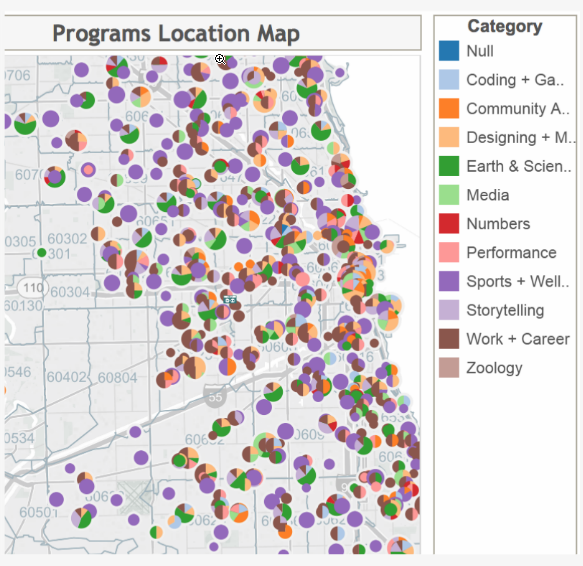 Chicago program offerings by category and zip code. We knew that these were data that we could act on. We couldn’t create programs in every neighborhood that was lacking them, but we could bring programs to neighborhoods across the city. We went mobile! With the support of Best Buy and in partnership with a community church, the Chicago Park District, and the Chicago Public Library, we rented (and bedazzled) a van and equipped it with trained digital mentors, laptops, and Wi-Fi. Our van visited South Shore, Garfield Park, and Chinatown – all neighborhoods with a wealth of programming, but scarce computer science opportunities. Our van also popped up in parks and events, enabling youth to “get connected” to our online offerings and hands-on making. The CCOL Destination: Chicago Van “pops up” at La Villita Park (Chicago Art Department). We are beginning to see how designing an equity-centric, robust learning ecosystem can make a city smarter – maximizing its abundant resources toward the education and development of all of its children. As the steward of Chicago City of Learning, DYN has had the privilege to partner with dedicated individuals from the city’s great community-based organizations, youth-serving agencies, schools, and cultural institutions. We all share a mission to connect youth to robust learning experiences that enhance and support their paths to exploring their interests, discovering their talents, and charting a course, enriched by formal and informal learning, to college and career. In Chicago, this has been a collaborative and collective process. Together, we built this City of Learning. The Destination Chicago pop-up shop traveled around the city to provide youth more opportunities. For nearly 10 years, the Digital Youth Network has provided Chicago’s under-resourced youth access to the ever-evolving array of tools and technology needed to be successful in today’s educational and professional world. Founded by DePaul’s Nichole Pinkard, associate professor in the College of Computing and Digital Media, the organization has gained traction over the last few years through successful outcomes, growing programs and funding from the MacArthur Foundation. Read on to learn just some of the ways the organization is making a difference. Challenge Your Students. Download DYN’s Challenge Template! We’ve been developing guides to help educators build self-paced learning experiences for youth. We’d like to share our Challenge Template as a free download. If you’re using an online system to design learning activities, or simply looking for a new approach to developing curriculum, check this out! If you’re attending ISTE 2015 in Philadelphia, please stop by Jim Sandherr’s table (#20) in the PCC Broad Street Atrium between 8:00 and 10:00 today to hear more about it. Download here as a PDF!